To Cite: Faridan M, Khavanin A, Mirzaei R, Salehnia M. The Effects of Normobaric Hyperoxia Pre- and Post-treatment on the Development of Noise-Induced Hearing Loss in Rats, Health Scope. 2017 ; 6(4):e63169. doi: 10.5812/jhealthscope.63169. Background: Occupational noise exposure is one of the leading factors for developing noise-induced hearing loss (NIHL), particularly among workers worldwide. The literature review reveals that beside conventional strategies for preventing NIHL, multiple interventions can be applied to reduce or prevent such disorders. The present study aimed to investigate the preventive effects of normobaric hyperoxia pre- and post-treatment on the development of NIHL in rats. Methods: Four groups of male Wistar rats were exposed to pure oxygen alone, noise alone, or oxygen plus noise for 6 hours a day, 5 days a week for 4 weeks. One group served as the control and received neither noise nor oxygen. Animals in the noise groups were exposed to high-pass white noise of 100 dB SPL, centred at 8 KHz. The treatment protocols were based on inhalation of pure normobaric oxygen (95%) for 3 hours in a chamber either before or after noise exposure. The auditory brainstem responses (ABRs) for click and 4, 6, 8, 12, and 16 kHz stimuli, as well as distortion product otoacoustic emissions (DPOAEs) at 4, 6, 8, and 10 kHz, were recorded to assess the level of hearing impairment before exposure and 4 weeks post-exposure. Results: The results showed that pre-treatment of rats with 3 hours of normobaric hyperoxia contributed to a significant reduction in ABR threshold shifts, while improving the DPOAE amplitudes (P < 0.01). However, three hours of post-treatment did not produce any comparable results in terms of ABR threshold shifts or DPOAE amplitude improvements. DPOAE amplitudes and ABR threshold shifts remained almost constant during exposure in the control group (P > 0.05). Conclusions: Pre- and post-treatment with normobaric hyperoxia seem to produce protective effects through either boosting cellular oxygenation or maximizing antioxidant enzyme activities and tolerance against noise-induced ischemia and hypoxia in the cochlea. Therefore, application of normobaric hyperoxia pre- or post-treatment, along with other conventional protective strategies, can be helpful in the fight against NIHL. Exposure to intensive noise may inflict damage to sensitive structural elements of the inner ear, mainly the basilar membrane within the cochlea and stereocilia of the outer hair cells (OHCs), leading to a permanent threshold shift, known as noise-induced hearing loss (NIHL). This irreversible and developing phenomenon has considerable social, economic, and physiological impacts, such as impaired hearing, poor communication, and poor health (1). According to the world health organization (WHO), occupational noise is a potential factor for the development of NIHL. It accounts for 16% of disabling hearing loss in adults, with disease burden ranging from 7% in developed countries to 21% in underdeveloped and developing countries (2). In Iran, nearly 2 million workers are exposed to noise levels above the occupational exposure limit or time-weighted average (TWA) of 85 dBA (3). Growing evidence shows that NIHL development is metabolic and attributed to the excessive generation of free radical species, such as reactive oxygen species (ROS) and reactive nitrogen species within the cochlea, leading to cell injury or death (4). Conventionally, hearing conservation programs (HCPs), including modification of noise sources through engineering techniques, use of administrative controls and personal hearing protection devices, regular hearing screening, and training of populations at risk, have been the only practical preventive measures in minimizing the risk of NIHL (5). Nonetheless, due to possible difficulties in executing HCPs, several alternative or complementary interventional approaches (pharmacological approaches such as use of antioxidants and other approaches using other agents) have been proposed to serve this purpose (6). Pre- and post-treatment with a wide range of stressors, such as hydrogen (7), hypoxia (8), hyperthermia (9), restraint (10), and noise (11-13), seem to protect hearing against NIHL. As free radical formation and disturbed oxygenation are the most important mechanisms in the development of NIHL, treatment with normobaric hyperoxia (NBHO), ie, exposure to 100% oxygen under normal atmospheric pressure, seems to induce endogenous defense mechanisms against free radicals produced in the cochlea and play a defensive role under ischemic and hypoxic conditions, caused by exposure to noise. The aim of this study was to investigate the effects of pre- and post-treatment with oxygen on the hearing of rats subacutely exposed to high levels of noise. Male Wistar specific-pathogen-free rats (weight, 180 - 200 g) were purchased from Pasteur institute, Tehran, Iran. They were housed in polypropylene cages (400 × 250 × 150 mm) with steam-cleaned pinewood bedding at 20 - 22°C with 40% - 50% relative humidity (10 times/h air displacement) in a controlled animal house. They were in a 12:12 hours light/dark cycle (from 8.00 p.m. to 8.00 a.m.) during exposure, and food (rodent chow; Pars Animal Co., Iran) and tap water were available ad libitum, except during exposure. All experimental procedures were approved by the ethics in experimental medicine committee of Tarbiat Modares University. The Declaration of Helsinki guidelines were respected throughout the study. Animals inhaled pure normobaric oxygen for 3 hours before or after daily 6-hour noise exposure. Noise exposure continued for 4 consecutive weeks (6 hours a day, 5 days a week). A high-pass white noise of 100 dB sound pressure level (SPL) centered at 8 kHz (HPWN/8 kHz) was used during exposures. Auditory assessments were performed, using distortion product otoacoustic emission (DPOAE) and auditory brainstem response (ABR) recordings. Figure 1 presents the experimental groups and time schedules of treatments and exposures. A reverberant custom-designed chamber of stainless steel with sidewalls of insulated glazing was made to conduct noise exposures in this study. 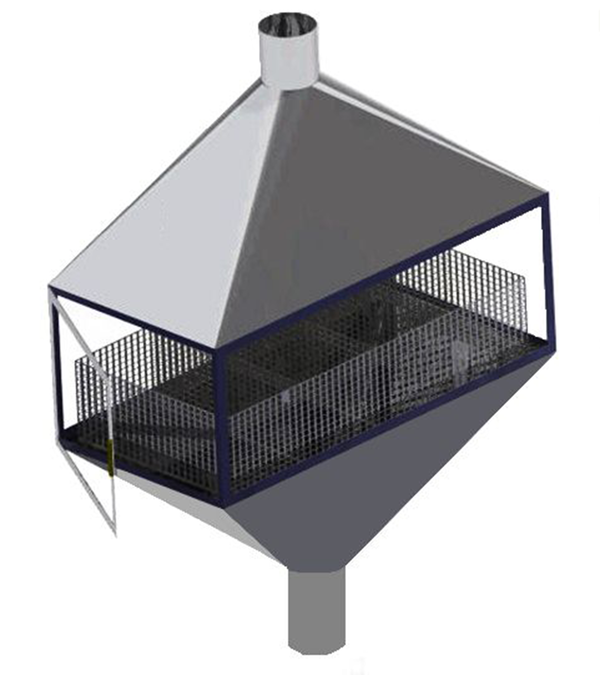 The chamber design facilitated animal observation during exposures, provided proper air exchange, and resolved problems related to animal waste removal (Figure 2). A centrifugal fan on the outlet of the chamber provided approximately 12 air changes per hour within the chamber. Temperature was maintained at 21 ± 1°C with relative humidity of 50 ± 10%. The rats were individually kept in stainless steel wire cages (20 × 20 × 18) with wire mesh floors. Noise was generated by the Filtered Noise Generator software (Timo Esser’s Audio software, version 1.2) and then recorded and played using the cool edit pro software (Syntrillium software Co., version 2.1). It was amplified by an audio amplifier (Pejvak Ava Co.; model, AP12) and delivered by loudspeakers (JBL GT6-6), located approximately 12 cm above the wire cages. The noise levels within the chambers were measured and analyzed, using a sound level meter (Casella CEL-480), which varied less than ± 1 dB (100 ± 1 dB SPL) between the measurement points. The cages in the chambers were daily rotated to maintain equal exposure for all rats in the chambers. An airtight Plexiglas chamber (650 × 350 × 450 mm) with gas inflow and outflow outlets was used for oxygen exposure. Temperature, humidity, and pressure within the chamber were continuously monitored by a digital thermometer (Samwon Eng. Co.; model, su-105ip), a digital hygrometer (Sunward Eng. Co.; model, sun 25 - 11), and an inclined manometer. Oxygen was supplied by a cylinder containing pure oxygen (99%) and an oxygen concentrator (Green Life); it was delivered at a gas flow rate of ≥ 5 lit/min. Soda lime (Marlic Medical Ind. Co., Iran) and silica gel (Silica Gel Derakhshan Co., Iran) were placed inside several specific containers within the chamber to remove CO2 and humidity, generated by the rats. Oxygen and CO2 content of the chamber were measured continuously by an oxygen meter (Lutron, DO-5510) and a CO2 meter (Lutron, GC-2028), respectively. ABR and DPOAE were used to assess the auditory functions of the rats. All measurements were performed inside a small sound-attenuated chamber. Both ABR and DPOAE tests were performed while the rats were under general anesthesia induced by intraperitoneal (IP) injection of ketamine (50 mg/kg) and xylazine (5 mg/kg). During the measurements, rectal temperature of anesthetized rats was measured using a digital thermometer (VAC-STAR, MH275) and maintained at 38.0°C by placing them on a heating pad (deltaphase isothermal pads, ASS7T 6” × 7.5”). Two pure primary tones (L1, 60 dB SPL; L2, 50 dB SPL; and L1-L2, 10 dB SPL) with f2/f1 of 1.25 were selected to measure DPOAE amplitudes at f2 frequency (range, 4 - 10 kHz), using a DPOAE analyzer (DPOAE 4000 I/O model; HOMOTH, Germany). The tones were delivered into the left outer ear canal with a converted newborn DPOAE probe, which sealed the ear canal. For each animal, a DP-gram was obtained prior to exposure (baseline DP-gram) and 4 weeks post-exposure. The DP amplitudes were reported as signal-to-noise ratio (SNR; subtracting noise level from DP level at each frequency). DPOAE was considered normal when the obtained amplitude minus noise floor exceeded 3 dB. ABR thresholds were obtained for the left ear of each animal, using the biologic navigator pro system (Natus, USA). Acoustic stimuli were presented as WAV files, using the selected transducer with program-controlled intensity and rate. The thresholds were determined for clicks and pure tones at 4, 6, 8, 12, and 16 kHz, using descending sound level series. Clicks and tone bursts were 5 ms in duration at a rate of 23.1/s. Electrical responses from 3 stainless steel needle electrodes (inserted subcutaneously at the vertex, mastoid, and hind leg) were amplified (× 100000), bandpass filtered (100 - 3000 Hz), and averaged at a sample rate of 1024 at each level. The sound stimulus was presented using a tweeter (Bruel and Kjaer), positioned 10 cm away from the rat pinna. Descending steps were used until reaching the threshold, and ascending 5-dB steps were taken to determine the threshold. The ABR threshold was defined as the lowest sound level where peak II could be identified by the investigators (14). Shapiro-Wilk test was used to examine the normal distribution of data. One-way ANOVA and Tukey’s post-hoc comparison test were performed for data analysis using SPSS version 18. The significance level was set at 0.05. As depicted in Table 1, there was no significant difference in the mean baseline ABR thresholds between the experimental groups. Figure 3 indicates the ABR threshold shifts and the difference in the mean ABR thresholds between the baseline and 4 weeks post-exposure in different groups. The ABR threshold shifts in animals solely exposed to noise were 7.2 dB at click, 9.85 dB at 4 kHz, 8.56 dB at 6 kHz, 8.20 dB at 8 kHz, 6.3 dB at 12 kHz, and 4.22 dB at 16 KHz. One-way ANOVA and Tukey’s test showed that the noise group had significantly elevated threshold shifts, compared to the other groups (P < 0.001). The noise + NBHO group showed moderate threshold shifts on ABR click test (2.2 dB) and tone bursts of 4 kHz (1.75 dB), 6 kHz (1.3 dB), 8 kHz (2.2 dB), and 12 kHz (1.55 dB). Comparison of the control, NBHO + noise, and NBHO (3 hours) groups indicated that the rats, which were post-treated with 3 hours of NBHO, experienced a moderate increase in the threshold shifts at all tested tone burst ABR frequencies and click ABR (P < 0.05). Analysis of NBHO + noise group showed ABR threshold shifts of 0.2 dB at click, 0.5 dB at 4 kHz, 0.92 dB at 6 kHz, 0.78 dB at 8 kHz, 0.22 dB at 12 kHz, and 0.23 dB at 16 KHz. According to the ANOVA test, no significant shifts were observed, compared to the controls and NBHO (3 hours) (P > 0.05). In other words, pre-treatment with NBHO for 3 hours was more effective in reducing click and tone burst threshold shifts at all frequencies. Table 2 and Figure 4 respectively show the mean values of DPOAE amplitudes in the experimental groups before exposure (DPOAE1 or baseline DP-gram) and 4 weeks postexposure. The baseline amplitudes typically ranged from 28 to 46 dB SPL at 4 to 10 kHz, respectively. As presented in Table 2, no significant difference was observed in the mean baseline DPOAE amplitudes at the evaluated frequencies (P > 0.05). The mean DPOAE amplitudes at 4 weeks post-exposure did not show any significant difference in the control and NBHO groups, compared to the baseline (P > 0.05). Nonetheless, as presented in Figure 4, there was a remarkable reduction in DPOAE amplitudes compared to the baseline in animals only exposed to noise at all tested frequencies (P < 0.001). Reduced DPOAE amplitudes were also detected in both groups of rats, which were pre- and posttreated with normobaric oxygen, although reduction was more evident in the noise + NBHO group (Figure 4). Although both NBHO + noise and noise + NBHO groups showed significant DPOAE loss at 4 weeks post-exposure in comparison with the controls and baseline DPOAEs (P < 0.05), reduction was more significant among posttreated animals, compared to the pre-treated ones. Statistical analysis also revealed that the mean DPOAE amplitudes in the NBHO + noise group fairly exceeded the DPOAE amplitudes in the noise group, which is an indication of significant recovery in DPOAE output in this group (P < 0.01). Although not as significant as the NBHO + noise group, ABR and DPOAE recordings of the noise + NBHO group also showed minor improvements. Application of pre- or posttreatment via hyperbaric oxygen therapy (HBOT) has been widely reported to play a major protective role in the reduction of injured cochlear hair cells and a defensive role against acute NIHL (15-18). However, several studies argue that HBOT may intensify the level of oxidative stress; the negative effect of HBOT on acute acoustic trauma has been also reported (19). Overall, there is no consensus regarding the ideal therapeutic time window or pressure for HBOT. Unlike HBOT, NBHO has shown significant protective effects against the development of various diseases and is recognized as a low-cost, noninvasive method of treatment. Inhalation of normobaric oxygen not only increases the level of oxygen dissolution in the blood, but also enhances the combination of hemoglobin and oxygen (20). Reduction of cochlear blood flow as a result of excessive noise exposure disrupts cellular metabolism and homeostasis due to inadequate oxygenation and waste product (eg, free radicals) formation; therefore, it may have severe consequences on the cochlear function and OHC motility. Although not significantly pronounced among posttreated animals, the present study indicated that treatment with NBHO resulted in improved ABR threshold shifts and DPOAE amplitudes, compared to the controls. Nevertheless, previous studies suggest that pre- and posttreatment with NBHO exert their protective effects via different routes. While NBHO post-treatment mainly exerts its protective effects by providing cells with oxygen and preventing ischemic and hypoxic conditions (21), NBHO pretreatment seems to induce ischemic tolerance and enhance protective enzymatic activities (18, 22-24). Prolonged NBHO pre-treatment is the main contributor to the increased activity of antioxidant enzymes within the cochlea, such as superoxide dismutase, catalase, glutathione peroxidase, and glutathione reductase (22). In the present study, the groups of rats with 3 hours of NBHO inhalation experienced almost prolonged NBHO pre-treatment; therefore, the protective effects are remarkably evident in their electrophysiological findings. In other words, duration of these treatments has been long enough to increase the level of antioxidant enzymes in the cochlea and hence provide reasonable protection against ROS formation and activities. The duration and time window for the application of NBHO, as a therapeutic or preventive agent, have been debated by several authors. Joglekar et al. are among the first researchers, who investigated the effects of high-concentration oxygen inhalation on noise-induced threshold shifts in humans and chinchillas. Their study indicated that 30 minutes of normobaric pure oxygen inhalation before exposure to a noise level of 100 dB SPL at 1000 Hz is an advantageous protocol in terms of both threshold shifts and recovery rates (25). Hatch et al. 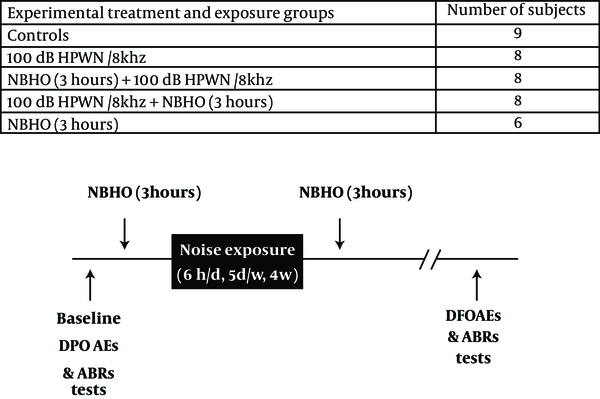 reported that administration of 100% normobaric oxygen to guinea pigs during exposure to 105 dB broadband noise for 6 hours a day during 5 consecutive days resulted in a marked decline in noise-induced threshold shifts. They concluded that cochlear oxygenation is more potent than the combination of oxygen with other gases, such as CO2, in protection of cochlea against NIHL. They also emphasized on the importance of exposure duration as a critical factor in treatment and conditioning (26). As mentioned earlier, the group post-treated with NBHO for 3 hours showed less potent recovery in terms of ABR threshold shift and DPOAE amplitude, which could be associated with the fact that immediate post-treatment with oxygen is not as efficient as delayed treatment. Such negative effects may be associated with the increased level of cellular free radical species (such as ROS), caused by NBHO treatment within the first hour of noise exposure, which normally goes beyond the capacity of antioxidant defense mechanisms (19). In other words, time is needed for activation of indigenous defense enzymes to reduce the effects of ROS metabolites within the cells. Although Lamm et al. concluded that cochlear hypoxia due to noise exposure could be effectively treated by HBO and not NBHO (18), the present results indicated that prolonged pre-treatment with NBHO (3 hours of NBHO inhalation) can compensate for the preventive properties of NBHO pre-treatment. Moreover, the possible side effects of lengthy oxygenation should be taken into account. The results of our study indicated that the rats, which had inhaled NBHO for 3 hours (with no exposure to noise), did not show any significant hearing impairments. Further research is required to investigate multiple aspects of NBHO pre-treatment and its preventive effects on NIHL development and hearing impairment. This study was supported by Tarbiat Modares university, Tehran, Iran (2012 - 2016). The authors would like to thank Dr. Mehdi Akbari and Dr. Fatemeh Heidari, as audiologists who assisted us in the implementation of DPOAE and ABR tests with their valuable insight and expertise. 1. National Institute on Deafness and Other Communicative Disorders . Noise-induced hearing loss. 2015. Available from: https://www.nidcd.nih.gov/health/noise-induced-hearing-loss. 2. Nelson DI, Nelson RY, Concha-Barrientos M, Fingerhut M. The global burden of occupational noise-induced hearing loss. Am J Ind Med. 2005;48(6):446-58. doi: 10.1002/ajim.20223. [PubMed: 16299704]. 3. Zare S, Nassiri P, Monazzam MR, Pourbakht A, Azam K, Golmohammadi T. Evaluation of the effects of occupational noise exposure on serum aldosterone and potassium among industrial workers. Noise Health. 2016;18(80):1-6. doi: 10.4103/1463-1741.174358. [PubMed: 26780955]. 4. Lu J, Li W, Du X, Ewert DL, West MB, Stewart C, et al. Antioxidants reduce cellular and functional changes induced by intense noise in the inner ear and cochlear nucleus. J Assoc Res Otolaryngol. 2014;15(3):353-72. doi: 10.1007/s10162-014-0441-4. [PubMed: 24497307]. 5. Sliwinska-Kowalska M, Davis A. Noise-induced hearing loss. Noise Health. 2012;14(61):274-80. doi: 10.4103/1463-1741.104893. [PubMed: 23257577]. 6. Le Prell CG, Yamashita D, Minami SB, Yamasoba T, Miller JM. Mechanisms of noise-induced hearing loss indicate multiple methods of prevention. Hear Res. 2007;226(1-2):22-43. doi: 10.1016/j.heares.2006.10.006. [PubMed: 17141991]. 7. Kurioka T, Matsunobu T, Satoh Y, Niwa K, Shiotani A. Inhaled hydrogen gas therapy for prevention of noise-induced hearing loss through reducing reactive oxygen species. Neurosci Res. 2014;89:69-74. doi: 10.1016/j.neures.2014.08.009. [PubMed: 25196919]. 8. Gagnon PM, Simmons DD, Bao J, Lei D, Ortmann AJ, Ohlemiller KK. Temporal and genetic influences on protection against noise-induced hearing loss by hypoxic preconditioning in mice. Hear Res. 2007;226(1-2):79-91. doi: 10.1016/j.heares.2006.09.006. [PubMed: 17107766]. 9. Yoshida N, Kristiansen A, Liberman MC. Heat stress and protection from permanent acoustic injury in mice. J Neurosci. 1999;19(22):10116-24. [PubMed: 10559419]. 10. Wang Y, Liberman MC. Restraint stress and protection from acoustic injury in mice. Hear Res. 2002;165(1-2):96-102. [PubMed: 12031519]. 11. Yoshida N, Liberman MC. Sound conditioning reduces noise-induced permanent threshold shift in mice. Hear Res. 2000;148(1-2):213-9. [PubMed: 10978838]. 12. Niu X, Tahera Y, Canlon B. Protection against acoustic trauma by forward and backward sound conditioning. Audiol Neurootol. 2004;9(5):265-73. doi: 10.1159/000080226. [PubMed: 15316199]. 13. Tahera Y, Meltser I, Johansson P, Salman H, Canlon B. Sound conditioning protects hearing by activating the hypothalamic-pituitary-adrenal axis. Neurobiol Dis. 2007;25(1):189-97. doi: 10.1016/j.nbd.2006.09.004. [PubMed: 17056263]. 14. Alvarado JC, Fuentes-Santamaria V, Jareno-Flores T, Blanco JL, Juiz JM. Normal variations in the morphology of auditory brainstem response (ABR) waveforms: a study in Wistar rats. Neurosci Res. 2012;73(4):302-11. doi: 10.1016/j.neures.2012.05.001. [PubMed: 22595234]. 15. Ylikoski J, Mrena R, Makitie A, Kuokkanen J, Pirvola U, Savolainen S. Hyperbaric oxygen therapy seems to enhance recovery from acute acoustic trauma. Acta Otolaryngol. 2008;128(10):1110-5. doi: 10.1080/00016480801901634. [PubMed: 18607951]. 16. Lafere P, Vanhoutte D, Germonpre P. Hyperbaric oxygen therapy for acute noise-induced hearing loss: evaluation of different treatment regimens. Diving Hyperb Med. 2010;40(2):63-7. 17. Colombari GC, Rossato M, Feres O, Hyppolito MA. 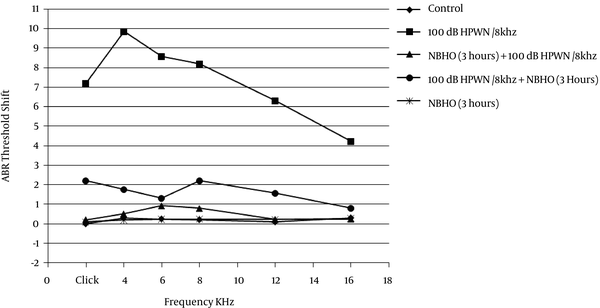 Effects of hyperbaric oxygen treatment on auditory hair cells after acute noise damage. Eur Arch Otorhinolaryngol. 2011;268(1):49-56. doi: 10.1007/s00405-010-1338-4. [PubMed: 20652293]. 18. Lamm K, Lamm C, Arnold W. Effect of isobaric oxygen versus hyperbaric oxygen on the normal and noise-damaged hypoxic and ischemic guinea pig inner ear. Adv Otorhinolaryngol. 1998;54:59-85. [PubMed: 9547878]. 19. Cakir BO, Ercan I, Civelek S, Korpinar S, Toklu AS, Gedik O, et al. Negative effect of immediate hyperbaric oxygen therapy in acute acoustic trauma. Otol Neurotol. 2006;27(4):478-83. doi: 10.1097/01.mao.0000224080.77849.3d. [PubMed: 16791038]. 20. Arslan HH, Satar B, Serdar MA, Ozler M, Yilmaz E. Effects of hyperbaric oxygen and dexamethasone on proinflammatory cytokines of rat cochlea in noise-induced hearing loss. Otol Neurotol. 2012;33(9):1672-8. doi: 10.1097/MAO.0b013e31826bf3f6. [PubMed: 23007643]. 21. Henderson D, Bielefeld EC, Harris KC, Hu BH. The role of oxidative stress in noise-induced hearing loss. Ear Hear. 2006;27(1):1-19. doi: 10.1097/01.aud.0000191942.36672.f3. [PubMed: 16446561]. 22. Bigdeli MR, Hajizadeh S, Froozandeh M, Rasulian B, Heidarianpour A, Khoshbaten A. Prolonged and intermittent normobaric hyperoxia induce different degrees of ischemic tolerance in rat brain tissue. Brain Res. 2007;1152:228-33. doi: 10.1016/j.brainres.2007.03.068. [PubMed: 17475225]. 23. Bigdeli MR. Preconditioning with prolonged normobaric hyperoxia induces ischemic tolerance partly by upregulation of antioxidant enzymes in rat brain tissue. Brain Res. 2009;1260:47-54. doi: 10.1016/j.brainres.2008.12.065. [PubMed: 19167368]. 24. Nasrniya S, Bigdeli MR. Normobaric hyperoxia (HO) preconditioning induces durable and effective neuroprotection against cerebral ischemia and mGluRII expression. Biomed Aging Pathol. 2013;3(3):137-44. 25. Joglekar SS, Lipscomb DM, Shambaugh GJ. Effects of oxygen inhalation on noise-induced threshold shifts in humans and chinchillas. Arch Otolaryngol. 1977;103(10):574-8. [PubMed: 907557]. 26. Hatch M, Tsai M, LaRouere MJ, Nuttall AL, Miller JM. The effects of Carbogen, carbon dioxide, and oxygen on noise-induced hearing loss. Hear Res. 1991;56(1-2):265-72. [PubMed: 1769919].